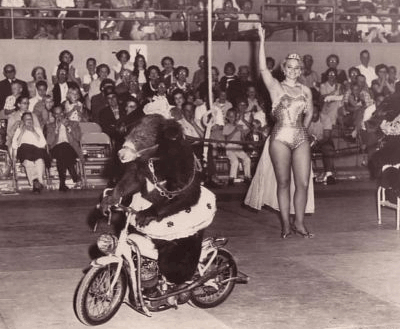 ﻿ Let the Baboon Drive, Dammit! Above all else, cats are fickle. One minute they're craving the wind in their hair and the joy of the open road. The next minute it's nap time. You'll need a well-thought out strategy to ensure a pleasant and safe ride for your feline friend. 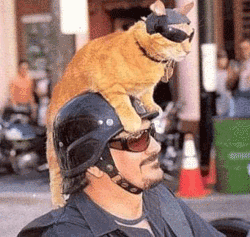 Many riders, like the one pictured at right, opt to let their cat have access to the elements and free range on the bike. 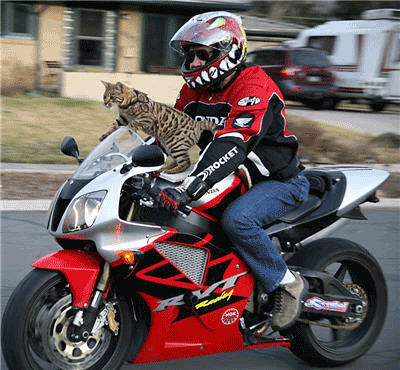 First off, your cat may see something interesting on the side of the road as you race by and feel the need to jump off. This can really can slow you down if you're in a hurry, adding minutes of cat-retrieval time to your daily commute. Second, your cat will have no way to transition gently into the sleep he so desperately needs. 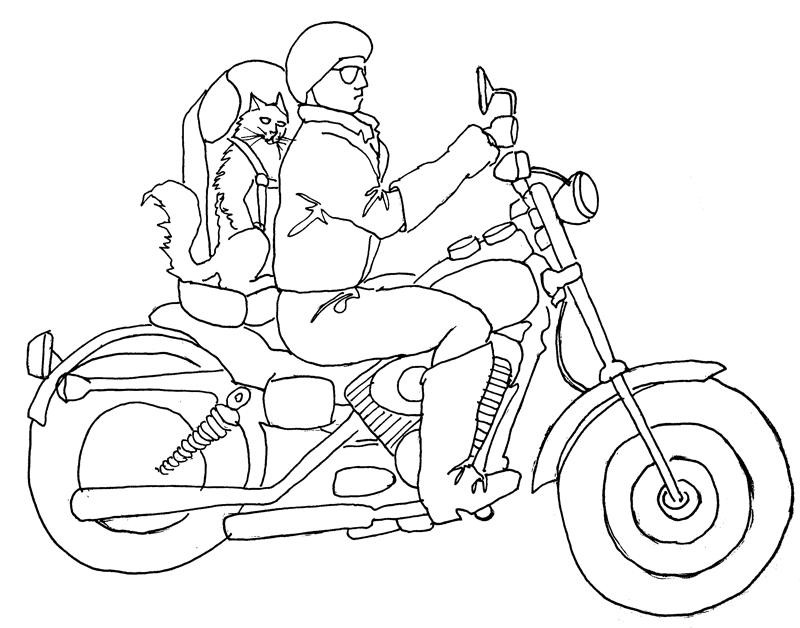 At left, observe the proper way to transport a cat on a motorcycle. Note that Fluffy is safely tucked in to a child seat with five-point restraining harness. This allows him to experience the feeling of freedom cats so often crave, while remaining safe, secure and, most of the time, asleep. And never, I repeat never, succumb to the temptation to put your animal in one of these. Illegal? Maybe. Major ridicule from your friends? Definitely. Cows may seem somewhat docile. But search the news for "Mad Cow" and you'll be surprised just how frequently incidents have occurred. 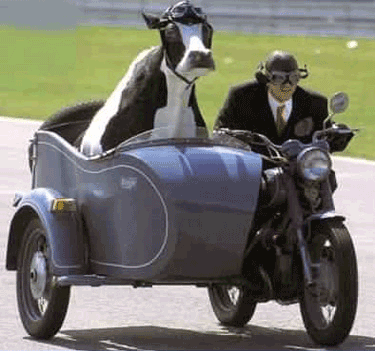 Transporting a cow on a motorcycle is a risky proposition. If you can keep the cow happy, you should be just fine. But make that cow mad and you're in for a rough time. Take that cow pictured at right, for example. Does she have room to lie down if it's going to rain? Does she have her daily ration of grass within easy reach? No and No. Driver beware, that cow is about to be mad. The cow below, on the other hand, is quite content. She's been given room to stretch out, has an ample supply of food nearby, and has an unobstructed, 360-degree view of the scenery as it rolls by. To top it off, should that cow become mad for some unforeseen reason, the driver has ensured that she'll be at a safe distance from the unhappy heifer. As in the wild, sheep need to be herded, organized, and given strict instruction in order to be successfully transported on a bike. What am I, an Airbag? 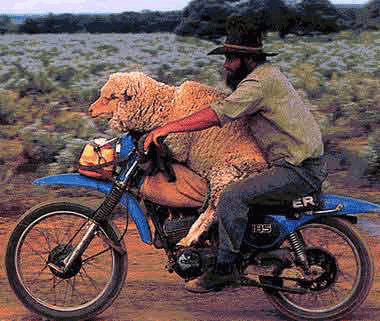 Bikers may assume that sheep, with their fluffy wool coats, make excellent pillows and/or protective gear. And yet, nothing could be further from the truth. 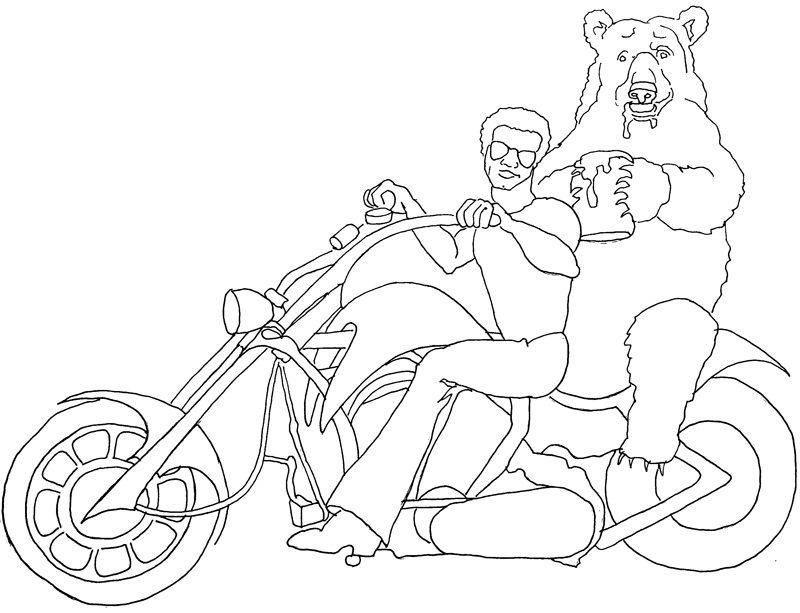 First off, no safety-conscious biker should position a soft cushion between him and his brakes. Sleep would be way too tempting on a long journey. Second of all, sheep do not make good safety gear. Sure, they may be fat and squishy, but their wool can be itchy and does little to prevent road rash in case of an accident. The correct way to transport a sheep, or an entire flock for that matter, is mostly a matter of organization. Just as sheep need shepherding in the wild, so too should you strive to reduce chaos in your ovine biker gang. Check out the movie at left (following a brief ad) to see just how it's done. 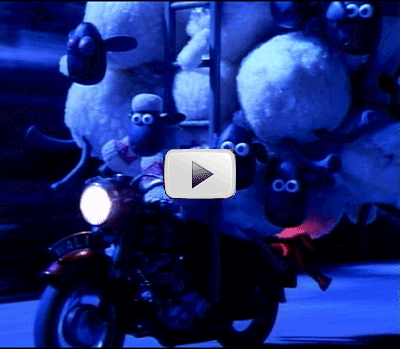 If Wallace & Gromit can pull off a daring rescue of a dozen sheep on nothing more than an underpowered street bike, then you ought to have no problem if you simply follow their lead. 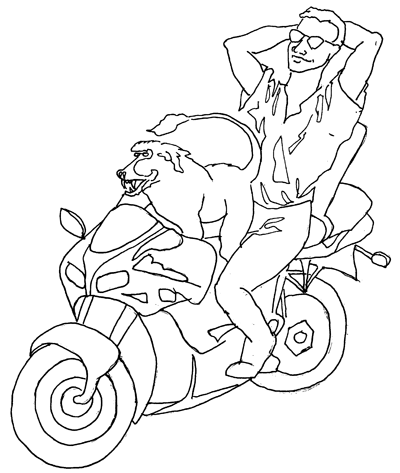 Dogs have just two simple requirements when on a motorcycle: to be near their owner and to have their tongue flapping in the wind. 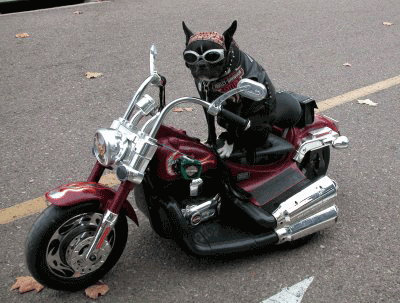 The dog pictured at right may look happy enough, decked out in his Harley gear. 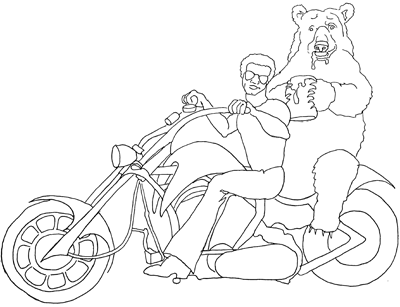 But note how he's been tasked with piloting this Hog without his owner. You can be sure that this dog is one lonely dude. 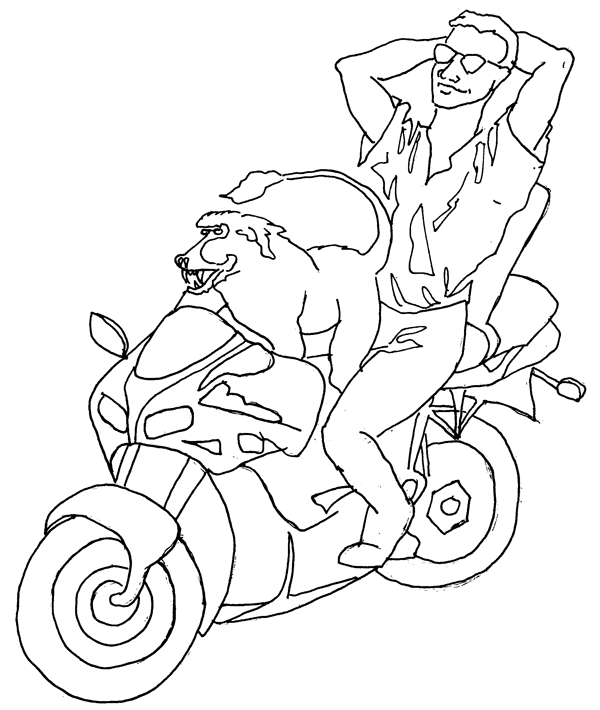 Furthermore, should his owner choose to join him on the front of this bike, our hero will be unable to access the glorious jet stream of wind that bike-riding dogs desire. Can you say pooch faux pas? 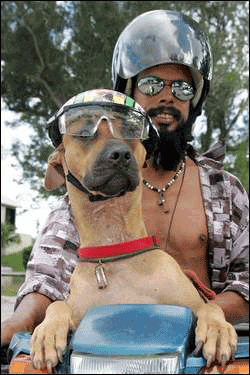 A happy dog, such as the one at left, will be properly situated on your bike and will sport proper safety equipment. In this case, Rex's responsible owner has taken all the necessary steps to ensure a fun-filled ride for both owner and canine. Note the addition of safety goggles, a must if you're serious about preventing cataracts in your dogs eyes as he stares intently into the wind. A monkey's mind will start to race if you don't give him something interesting to do. Let him be a bike racer instead. Next to humans, monkeys are the most intelligent creatures on this planet. What's that you say? Dolphins? Please... Ever get stuck behind one on the New Jersey Turnpike at rush hour? Don't waste my time. The problem with monkeys, of course, is that they can't keep their clever little minds from dreaming up all sorts of crazy tricks. That's the last thing you want when you're trying to get home to the wife and kids in time for dinner. Instead, why not put the little guy to work doing what monkeys do best? 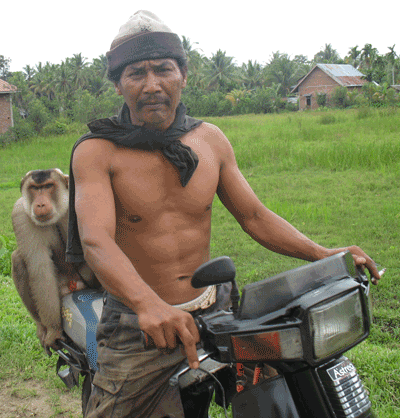 Consult our diagram at left for the most successful way to commute with your baboon. 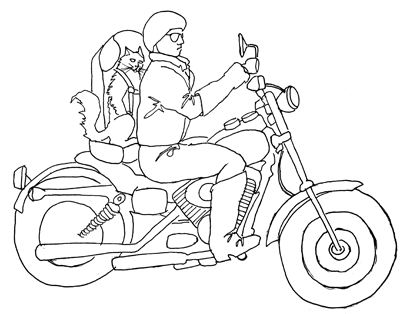 Driving a motorcycle is a sufficiently complex task to keep your pet occupied and frees you up for that big-picture thinking that humans do best. At first, you'll feel tempted to micro-manage your monkey's driving technique. But then you'll realize that he's no worse than all of the other gorillas on the road. Then you'll be able to sit back, relax, and enjoy the ride. That's the Truth... And I Ain't Lion. Sure lions are dangerous, but only when they feel threatened. Keep your pet calm and worry-free for a successful commuting adventure. 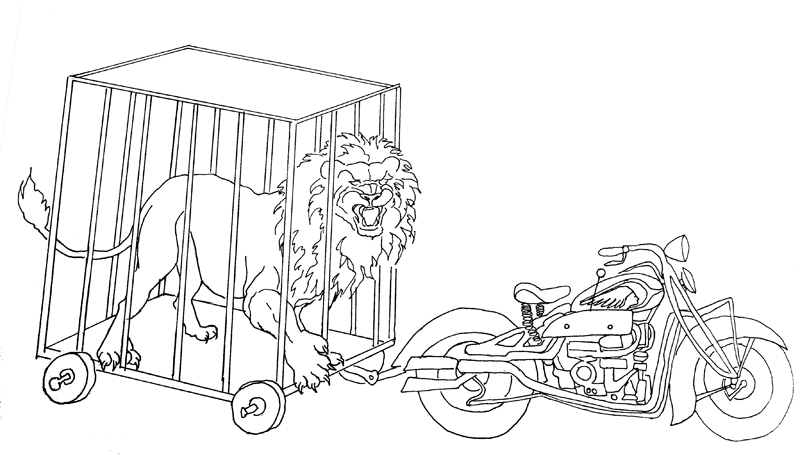 The last thing you'll want to do when loading your lion on a motorcycle is show signs of aggression. Baring teeth, roaring, and locking him in a cage should all be avoided. Fig. 2:What Kind of Circus is This? Note how the lion pictured above has been carefully contained in a steel trailer cage. Think that will contain him when he spies a gazelle or springbok on the side of the road? Think again. Fig. 2: Yes, it's real. See the original here. Give your lion a sense of freedom and respect and he will calmly ride wherever you take him. 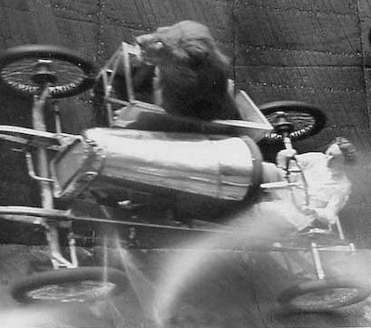 Amusement park daredevils of the 1930's, such as the one pictured at left, knew this and used it to their advantage. 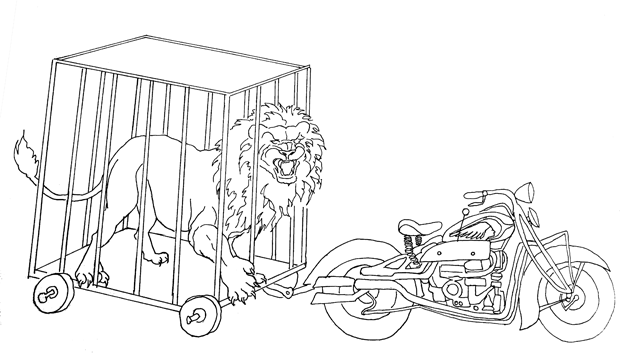 Yes, I know the driver is in a car and not a motorcycle, but the principle remains the same — treat your lion like a man and he'll treat you like the lazy kitty that he yearns to be. Oh, and as an added bonus, you can save money by ditching the alarm. You're not going to need with Kitty around. Fig. 1: Oh, the Embarrassment! Hamsters are a proud species. Quiet and regal, yes, but proud nonetheless. Your job is to ensure that their pride is not compromised. The hamster at right is mortified. Check out the look in his eye — this hamster has been emasculated. Hammy should be on the bike, not in the bike. His need to be in constant motion, coupled with his proud nature, make him a perfect candidate to be a daredevil, not a mere wheel-runner. 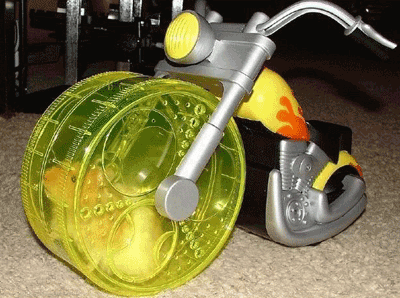 Our recent Hammy Rides Again article illustrates perfectly how hamsters like to roll. Check out our video below to see Hammy in action, defying death in a way that most bikers would be way too timid to emulate. Where Does He Sit? Anywhere He Wants. 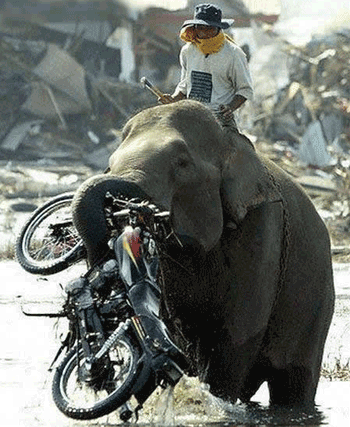 In many parts of the world, owning a pet elephant is quite common. So we'll look to those parts of the world for the keys to transporting an elephant on a motorcycle. Elephants are good natured enough pets. 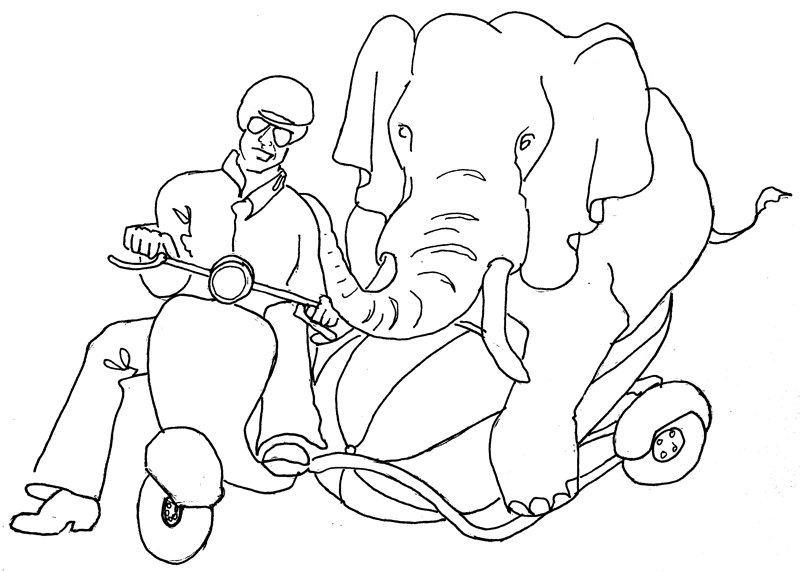 Happy to help out with an honest days work, the elephant is a prime example of the pet that pays for itself in no time. But do not forget that, along with its heft comes a hefty need to sit back and relax once in a while. The elephant at right is being asked to work too hard. Carrying a man or a motorcycle might be a reasonable request. But both at once, through a river? C'mon man, have a heart! 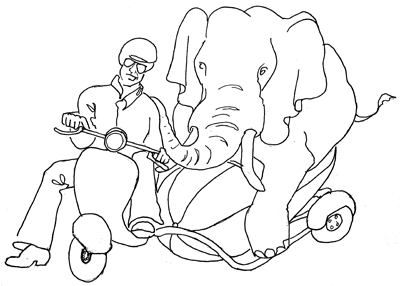 The simple addition of a sidecar to your motorcycle or scooter can make a world of difference for both you and your elephant. The beast pictured at left is not slacking off by any means — he's resting up for the next session of hard work. His owner knows he can share the thrill of a bike ride in the country with his hard-working pal, and be repaid many times over in the future. Did we miss your favorite domesticated animal? It should be obvious how to transport chickens and goats, but snakes and guinea pigs will present special challenges. We'll cover all of these (and more) in future updates. In the meantime, should you successfully apply any of the techniques described above, let us know how it went in the comments below. If you're unsuccessful, please keep it to yourself. We don't want to disturb the animals. What about a large boa constrictor or python? If large enough, could even function as a spare tire if worse came to worse!